For years computers have been able to create large models of molecules that allow scientists to get a closer look at the microscopic particles. However, this was limited by the fact that scientists only had a flat screen to examine and manipulate the molecule. But once again 3D printers have solved this research hurdle and made it easier for researchers to design more efficient drugs and medical treatments. Arthur Olson is a molecular biologist at the Molecular Graphics Laboratory at the Scripps Research Institute. Proteins within the body can contain thousands of atoms and this makes it incredibly difficult to see how the proteins fold up or how different molecules interact with the forces around them. 2d models on computers also struggled with this as atoms and molecules would simply go through each other when researchers tried to move them around. With 3d printed models researchers can move the molecules in a way they would naturally interact without worrying about the molecules passing through each other. Another amazing aspect of 3d printed models is that it allows researchers to see how long tunnels within proteins really are. These curvy tunnels allow molecules to pass through the protein but they are very difficult to examine or measure on a 2D model. With the 3D printed models, researchers can easily determine the length of the tunnels. Arthur Olson is currently using his models to advance the study of HIV. The models are helping him and other scientist understand how the virus functions in order to create drugs that are better able to treat the virus. 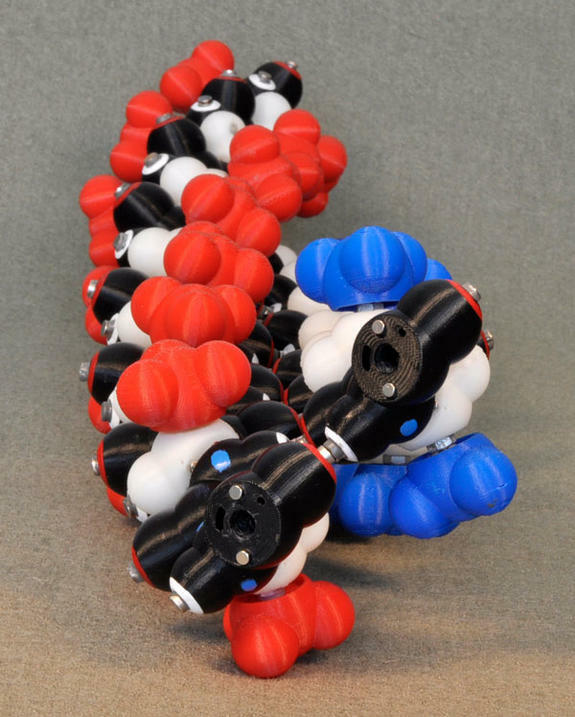 Ron Zuckerman is using 3D printing to also study proteins and show his students how flexible proteins really are. He is also creating synthetic molecules called peptoids which have the sensitivity of proteins ( to detect things like poisons or explosives in an area) but are able to withstand more extreme conditions (proteins do not do well in hot, cold or dry conditions).